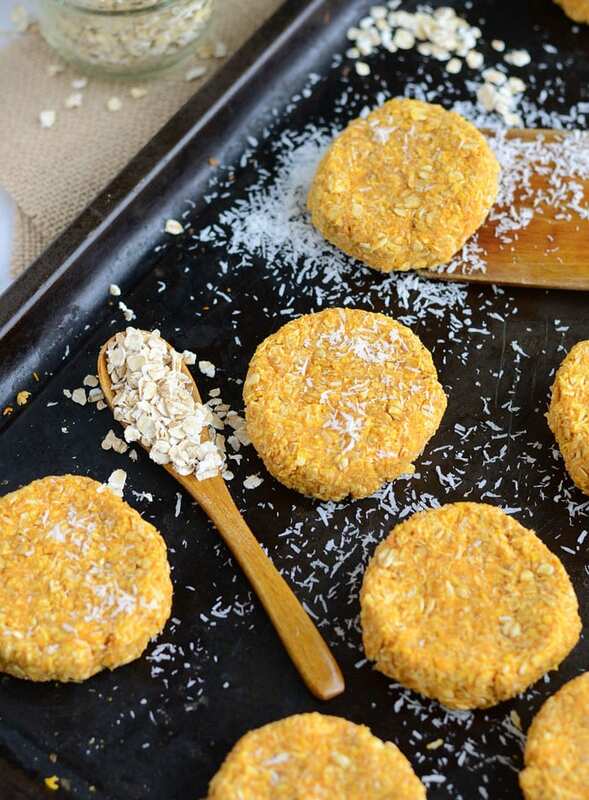 Healthy Vegan Sweet Potato Coconut Oat Cookies - Just 4 Ingredients! 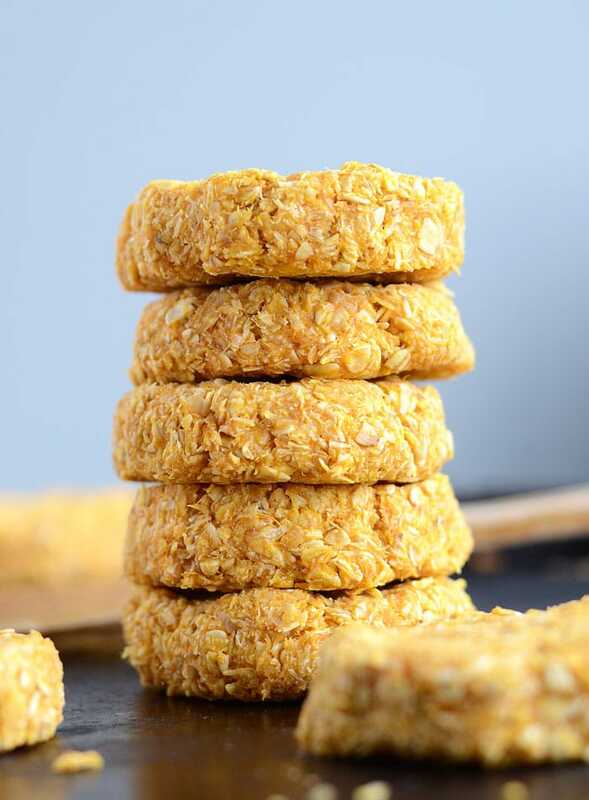 These sweet potato coconut oat cookies are made with just 4 ingredients: coconut, oats, sweet potato and sweetener. They’re fantastic as a healthy but satisfying snack, breakfast on-the-go or to fuel up before a tough workout. With healthy carbs from oats and sweet potato, you can also enjoy them post-workout to kickstart the recovery process. Whenever you decide to eat them, you’ll love the hearty texture, subtle sweetness and delicious coconut flavour of these healthy treats. Running on Real Food recipes are getting simpler and simpler by the day. You’ll notice I’ve been sharing recipes with 2, 3, 4, maybe 5 ingredients. I love cooking and baking with as few ingredients as possible. I know when I’m looking for recipes to try, unless it’s a special occasion I skip right over anything with a super long ingredient list. So, let’s add another super easy, quick, yummy and healthy simple recipe to the collection, shall we? These are going on my weekly food prep list for sure. Every Sunday, I bake a big batch of sweet potato anyways so I can always spare some to make these cookies. 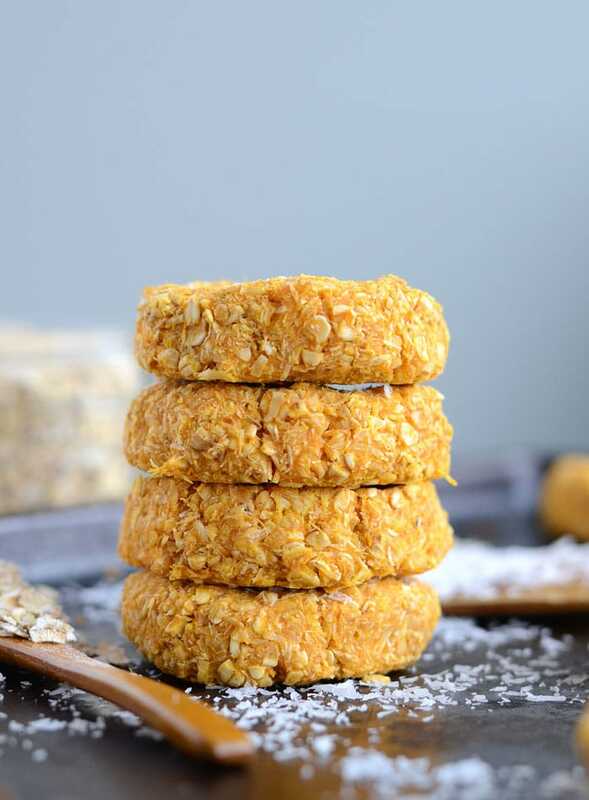 Sweet potato, coconut and oats are all big staples in my kitchen so if you love those ingredients like I do, you’ll always be ready to make these! Organic stevia drops are my go-to sweetener when I’m tracking macros but you could use another sweetener if you prefer. If I’m not using maple syrup or date paste, there are a few different low carb sweeteners I use my kitchen. However, I like organic stevia drops the best because they’re perfect for sweetening pretty much anything without adding volume. Aside from stevia, I sometimes use xylitol, erythritol or monk fruit. 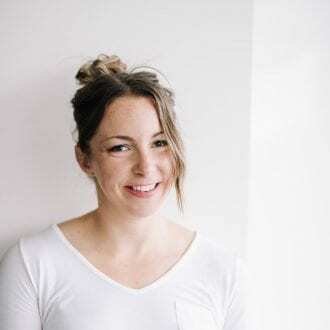 The brands I’ve used with success are Xyla for xylitol, Now Foods Xylitol and Erythritol and Lakanta for their Erythritol and Monk Fruit Sweetener. If you’re not concerned with carbs, I’d recommend using a good quality, pure maple syrup as a sweetener. I also like using coconut sugar, agave syrup and molasses as natural sweeteners. You can find Organic Stevia Drops on Amazon. I usually get the Now Foods brand. For a 4-ingredient, healthy cookie, they are really, really good, like surprisingly addictive. The texture is awesome and for 125 calories each they’re hearty, satisfying and surprisingly filling. You can really taste the coconut too. I recommend using a good quality, organic, fine unsweetened coconut for best results. I like this brand. I’ve made them with cheaper coconut and you just don’t get the same coconut flavour. Plus, at just 17 grams of carbs, 5 grams of fat and 3 grams of protein per cookie, they’re macro-friendly and easy to fit into any healthy diet. Use your hands to form the dough into 12 equal sized balls, then shape each ball into a cookie. If you enjoyed this recipe, don’t forget to take a moment to share it via social media! If you make any changes, additions or substitutions I’d love to hear about and it helps out other readers too, so be sure to come back and leave a comment with your feedback. I really appreciate it! Hope you enjoy! Maybe 1-2 tbsp? Start with 1 tbsp, taste the mixture and add 1 tbsp at a time to reach your desired sweetness. If it becomes to wet, just add a bit more oats until you can create cookie shapes. If I don’t have the Stevia drops on hand, how much maple syrup would I need to use? Thanks! Maybe 1-2 tbsp? Start with 1 tbsp, taste the mixture and add more to your desired sweetness. 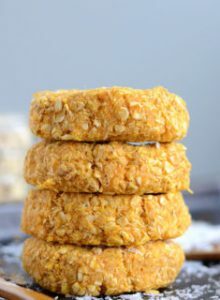 If it becomes to wet, just add a bit more oats until you can create cookie shapes. Hi I am going to make these! Already shared the link to this post on my blog for my readers. Being a nutritionist and a vegetarian myself, I love healthy snacking options and these fit the bill perfectly for a snack or a pre or post workout bite. Great! Thanks for sharing. Let me know how you like them. How long should I bake the sweet potato before mashing it? Until you can easily peirce it with a fork, depending on the size of the potato, 30 to 45 minutes.